Geno in Super Smash Bros.
Geno is quite a popular choice when it comes to character requests for the Super Smash Bros. series, and so there is plenty of fanart out there in support of his inclusion. While this makes my drawing a bit redundant (and the special moves are all pretty much what everyone else has for Geno’s attacks), I felt that the concept of Geno as a playable character could be taken an extra step beyond simply having his moves map 1:1 with his Super Mario RPG techniques. In particular, I had this idea that Geno could utilize the “timing” system from Super Mario RPG where pressing or releasing a button at the right time makes the characters’ attacks stronger in some way. 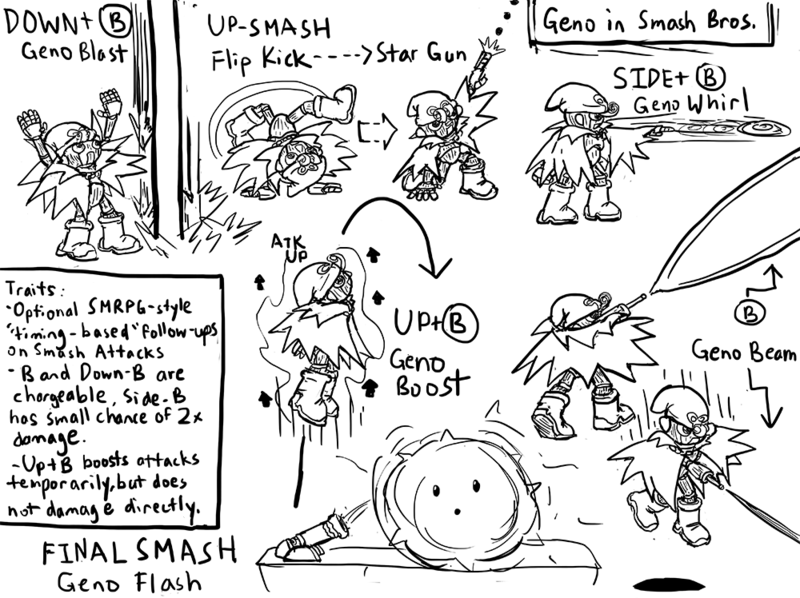 This is demonstrated not only in the depiction of Geno Beam and Geno Blast, but also in Geno’s smash attacks. As shown with Geno’s up-smash, the idea is that Geno’s smash attacks have an additional secondary component that Geno can chain into, similar to Kyo Kusanagi in the King of Fighters series or Fei Long in the Street Fighter series. Because it wouldn’t be terribly strategic to have the follow-up be automatically better every single time, the secondary part of every Smash Attack would have its own strengths and weaknesses (like leaving Geno vulnerable if the first part doesn’t connect properly, or not hitting at the desired angle at high percentages), so it would be an active choice at all times whether or not to use the timed attack system. Other than that, Geno would have two other main features. The first would be his space control due to the fact that many of his attacks are ranged and come in at odd angles instead of straight-on (Geno Beam shoots diagonally upwards on the ground but diagonally downwards in the air, for example). The second would be that Geno’s normal moves emphasize the fact that his body is that of a doll, so it is extremely flexible, as demonstrated in that up-smash. This would give Geno a lot of unusual hitboxes on his attacks or allow him to slip past attacks by suddenly collapsing low to the ground, for example. This entry was posted in art, smash bros, video games and tagged geno, smash bros 4, super mario rpg, tablet. Bookmark the permalink.